My friend Michelle and I have been huge fans of KimChi (KimChee) since we were little kids. It is one of the many tastes that our palates agree on. 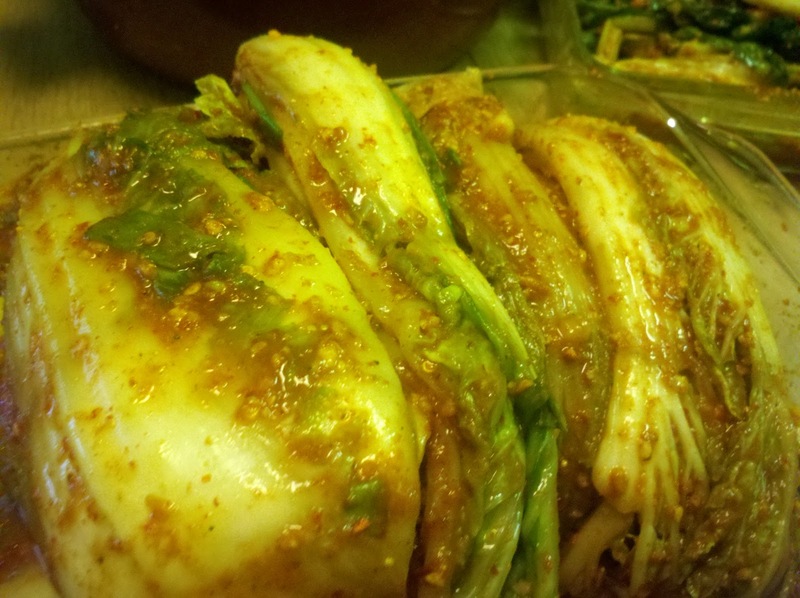 We both love one particular store bought brand, however it does not have all of the wonderful healthy bacteria (lactobacilli) that fermented KimChi has. 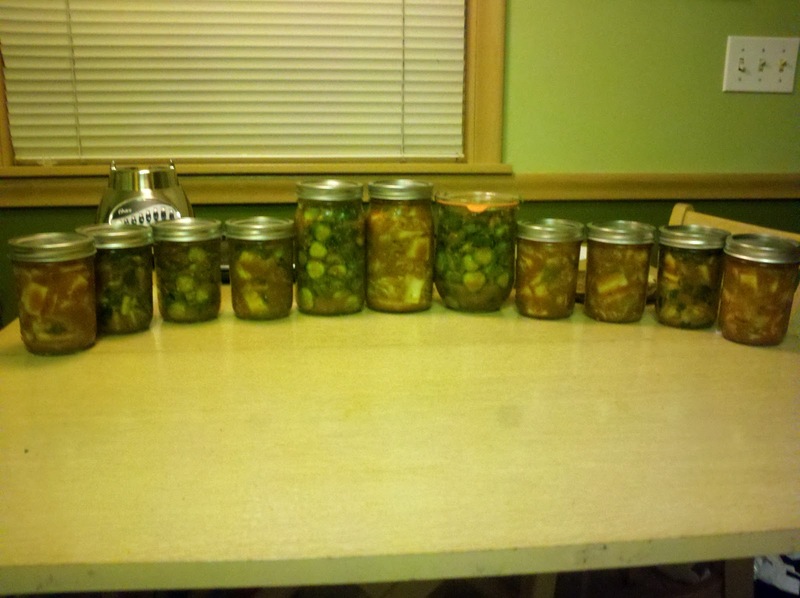 After talking about making our own homemade KimChi for several months, we finally did it! I have to say that it was one of the most exciting things I have made in a long time. Though making it is pretty easy, it is a long process. 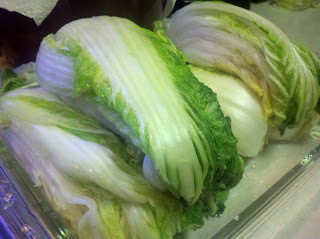 First you have to clean, cut and salt the napa cabbage. 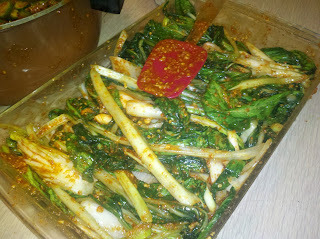 We also used Bok Choy that Michelle grew in her garden. The salting process takes 4 hours and everything needs to be flipped over at the two hour marker to ensure even salting. After 4 hours of salting, thoroughly rise several times, set aside to dry and start to concoct the base. 4 hours later... Rinsed and ready to go! Our base included: 7oz of hot chilli pepper flakes, 4 bulbs of garlic, 2 small onions, a huge chunk of ginger, 7 scallions, a cup of fish sauce, water and rice flour. 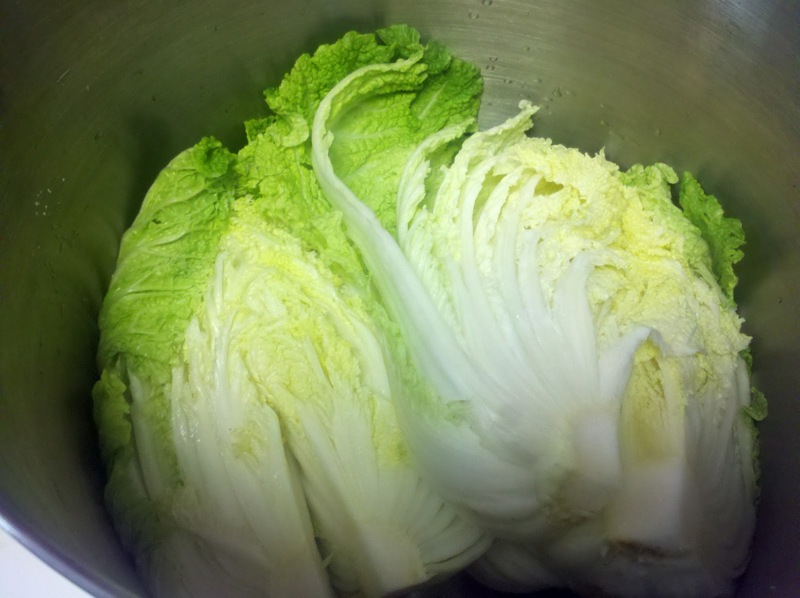 Then, saturate the base over each leaf of cabbage. Michelle loves KimChi cucumbers as well so we used up some leftover pickling cucumber that I had as well. Gloves are a requirement for this process! Hot, hot hot! Be sure to get in between each leaf! 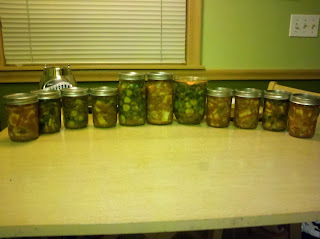 Ferment at room temperature for 24-48 hours in an air tight container and then refrigerate. It is also enjoyable to eat immediately. KimChi is high fiber, low cal, VERY flavorful, versatile, loaded with vitamins A, B and C and laden with great-for-the-belly bacteria! OMG this looks absolutely amazing and delicious!! I would love to try it ... but don't know that I'll be able to channel my canning genuis of a Nana to help me through it all LOL! It is really worth the work. Give it a try! 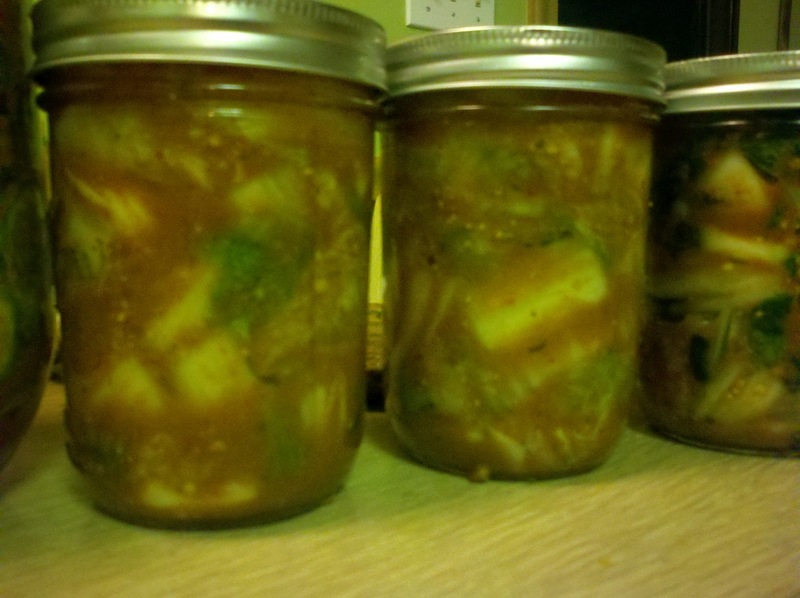 I haven't made kimchee in a really long time, but I let it sit for so much longer when I used to. 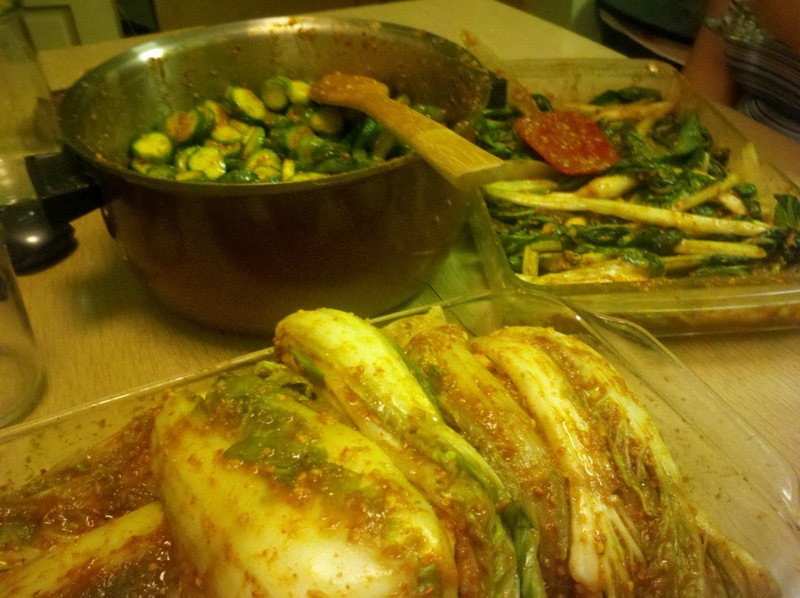 I will be making it again, it's quite a staple for me, since I grew up eating kimchee...and it's so much better and less expensive to make it at home. Thanks for sharing the pics and blog!